We offer expert advice from staff with years of experience in the corporate sector, delivering cutting edge IT solutions. We are a consultancy-led organisation; from initial enquiry through to operational support, we continually test and ratify the outcome of every project to ensure we are delivering to each clients’ specific business needs. We really do believe that our IT Consultancy services are market-leading. As the evolution of technology continues, 5th Utility will keep you informed of the latest changes through our IT consultancy service. We give you ‘best advice’ on developments and projects, providing IT strategy, cost planning, providing IT Directorship and Management to companies requiring support. We match the right technology to your business needs, so you aren’t over engineering your IT infrastructure and wasting time and money on unnecessary solutions. Our customers benefit from a a well designed IT provision, with pro-active strategy and cost planning. 5th Utility has decades of specialist knowledge that can support you in decision making on a myriad of desktop and infrastructure subjects as well as the latest emerging technologies. We can help you navigate through project management and builds to crisis management as well as site planning, audits and surveys. Get in touch with us today to discuss your IT consultancy needs and we’ll be happy to help. Call us on 03300 53 59 55. What do our customers think of our IT consultancy service? We help clients build their IT and Security strategies, aligning them to the business goals and targets. This helps create a clear plan, with predictable outcomes for the business to follow. As businesses grow, and regulations change, the need to have clear concise policies becomes more important. We help customers understand their obligations, and help them with the creation of policies to support this. Cost planning enables the business to review it’s previous, and current IT spend, then forecast future spend. Aligned with the IT strategy, this underpins the IT teams activity, and allows clear reporting and measurable performance. When an office move is underway, it usually involves the services of many suppliers (Infrastructure, Telephony, Internet, Security, Access Control, CCTV, M&E, Small Power, Architecture, Electrical, Fit-Out etc). Yet the customer is left alone to co-ordinate all of these, which often results in timely and costly errors. At 5u, we can provide the project and program management to ensure the complete IT project runs smoothly, by working for the customer to manage all of these trades, leaving the client to focus on their core business. Your IT infrastructure supports every other aspect of your IT provision. It is therefore essential that this is done correctly. We can assess your existing infrastructure, make recommendations on improvements, or design a new implementation from scratch. When designed and implemented properly, your infrastructure is invisible to the users, when done badly, every other aspect of your IT will incur problems. 5u help organisations with their GDPR and other compliance requirements. Whether that is through planning, advice and training, a more structured compliancy service, or fully outsourced DPO, we help our customers make compliancy simple. When a major IT project is underway, it usually involves the services of many suppliers (Infrastructurte, Telephony, Internet, Security, Access Control, CCTV, M&E, Small Power, Architecture, Electrical, Fit-Out etc). Yet the customer is left alone to co-ordinate all of these, which often results in timely and costly errors. 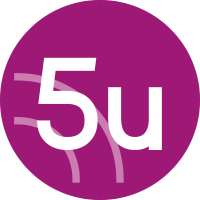 At 5u, we can provide the project and program management to ensure the complete IT project runs smoothly, by working for the customer to manage all of these trades, leaving the client to focus on their core business. Senior Management Teams are often baffled by the proposals supplied by IT companies. We can help at each step. That may be working with the client to define their requirements, drawing up specification documents, to provide to suppliers, or reviewing proposals and quotes, and explaining to our clients what has been proposed. We compare proposals, to help our clients understand the differences, and help our clients be making recommendations that reduce the overall costs. As well as our range of consultancy and infrastructure services, we offer a market-leading business IT support solution. Whether you’re looking for simple pay-as-you-go support or a more proactive service to support your business, our staff will be well placed to help.